Reliance offers a number of controls options from Push Button to PLC Operated Systems. 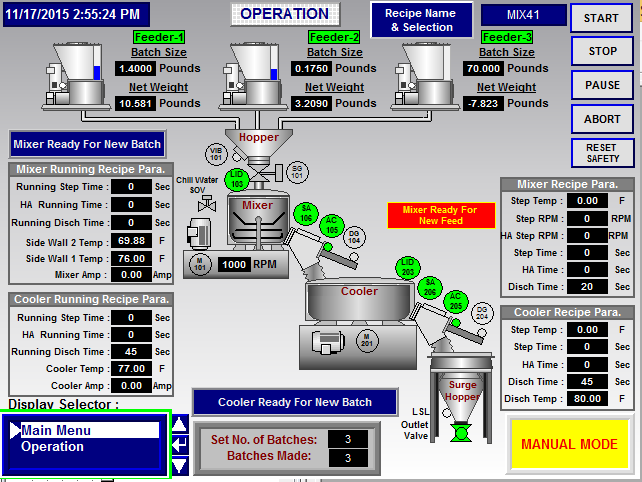 Control Panels can allow for recipe storage, parameter retrieval, automatic or manual cycle operations, and much more. Controls can be easily tied into existing systems if need be. Parts drawings and manuals can be pulled up from the PLC, allowing operators fast troubleshooting capabilities and proper maintenance procedures. Stand Alone Mixer Controls: Stand Alone Control Panels can be used to control Mixers that require more than a simple on/off functionality. Drives can be integrated to increase or decrease the speed of the motor during the cycle of the mix. Temperature Sensors, Timers, and Amp meters can be used set parameters for step controls. Recipes can be stored and trend reports can displayed to give the Mixer more operator usage. 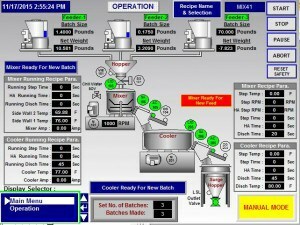 Semi-Automatic Controls & Automation: Control Panels can be used to control and operate Mixer/Cooler Combinations for specialty operations. 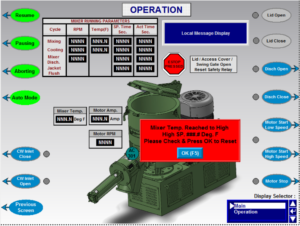 The System can run in Automatic or Manual mode and can display and control all upstream and downstream equipment. Current Mixing steps and Mixing parameters can be displayed on the HMI for the Mixer or the Cooler. Components can be controlled manually for trouble shooting or on the fly controls.